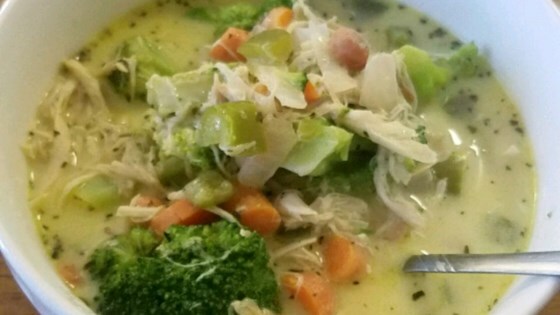 "Dinner's on the table in less than 30 minutes with this creamy, hearty chicken and broccoli soup." In a large saucepan or Dutch oven cook and stir broccoli, mushrooms, carrot, and onion in hot butter 6-8 minutes or until vegetables are tender. Stir in flour, basil, and pepper. Add milk and half-and-half all at once; add Worcestershire sauce and bouillon granules. Cook and stir until thickened and bubbly. Add Grilled & Ready(R) Diced Chicken; heat through. Serve with a tossed green salad and soft breadsticks. This was so good. I added a handful of shredded cheese while cooking. Then added asprinkle on top when served. So glad I doubled the batch for 4 of us. There will barely be enough leftover!! I added some processed cheese like Velveeta and a little garlic powder. Very good and creamy on a cold winter night.